The hotel "Slavyanskij Alyans" provides with a variety of roos to any taste. You can book any room: the rooms of the highest category, de lux rooms with bedrooms, penthouses. Each of them is equipped with refine furniture, videosystems, satelite TV, phone, jakuzzi, airconditioners, TVsets, Wi-Fi wireless free Internet. Breakfast is delivered into the room at any time you wish. 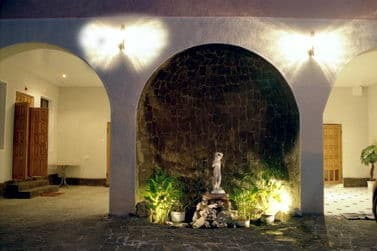 A twenty-four-hoyr service of the hotel and attentive staff will surround you with the care and warmth while you are staying with us. 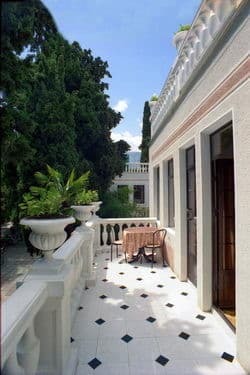 We do everything possible in order to make your rest in Yalta a fairy-tale and it order that it leaves only plaesant recollections! We work for you all the year round. 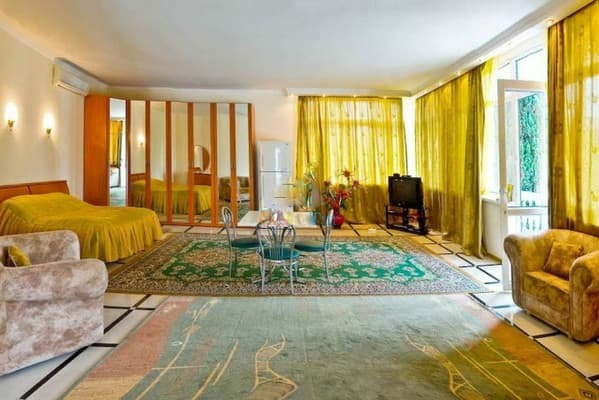 Description of the room: Each room is equipped with luxurious furnishings, most rooms have a balcony or terrace, bathroom with shower or Jacuzzi or bath with Jacuzzi and shower, TV-set, refrigerator, air conditioner, telephone, alarm system, internet. 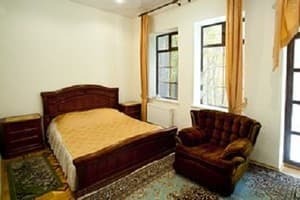 Description of the room: The rooms are 55 sq. M., Located on the 1 st, 2 nd, 3 rd and 4 th floors of the second building. In the room furniture, satellite TV, telephone, security alarm. The bathroom is equipped with a bath. 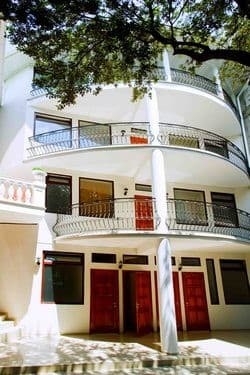 Most rooms have 1 or 2 balconies. Description of the room: Located in the 1-m building. The room consists of a bedroom and a living room. In the room furniture, satellite TV, telephone, security alarm. 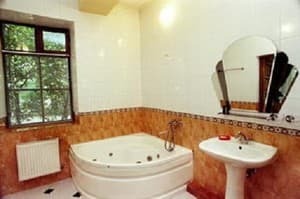 The bathroom is equipped with a bath or shower. One of the rooms has a balcony. Останавливался в отеле с 19.10. по 21.10.2012 На отеле отсутствует название; Рецепция находится в маленькой комнатке (типа кладовки), закрыто наглухо дверью и отсутствует надпись где ее искать; В ванной комнате нет мыла, забита раковина, возле ванны нет шторки и вся вода летит на пол. Есть один пакетик шампуня "Ромашка-очаровашка" и на нем написано "для белокурых и светлых волос". "Завтрак" готовит повар, она же уборщица, которая ходит в курточке, на столах грязь. Жареную колбасу не стали есть даже местные коты! Обратился с просьбой вызвать такси в день отъезда - посоветовали поискать машину возле остановки "Спартак"; Отель огорожен черным металлическим забором, нигде нет надписи "вход". Рядом с отелем ведется стройка и если у Вас окна во двор - то будете постоянно видеть строителей и они Вас очень близко. На балконе нет летней мебели. Я жил в № 4. Не советую никому останавливаться в этом отеле. Персонал не дружелюбный, не здороваются. За 2-е суток уборку в номере не делали ни разу. Children from 2 to 5 are accommodated free of charge. The price of the additional place - 15%surchase from the price of the room. 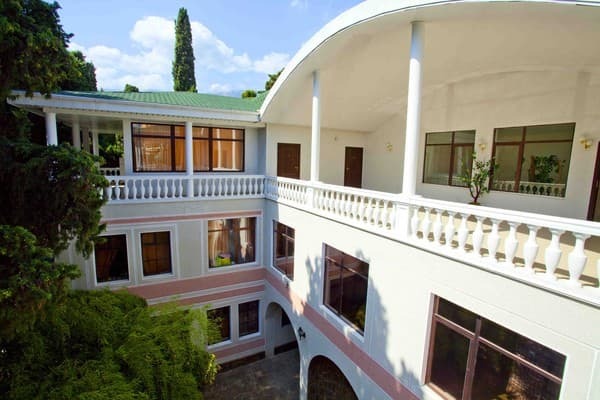 Is situated in the centre of Yalta, in a quiet zone, far away from noise. Nearby there is a seafront and the sea. On the footpath lane - Pushkinskij boulevard. From the airport of the city Simferopol 70km to Yalta, Pushkinska street 11.